Asia's top 10 super-deluxe homes ranking was unveiled in Hong Kong on September 28. China can currently boast the largest number of luxury residences, with two in Hong Kong and four in the Chinese mainland. The other four were located in India, Turkey, Indonesia and Singapore. The list reflects how Asian consumers, especially the wealthy Chinese, have developed a strong purchasing power only five years after the global economic crisis. Unlike European luxury consumers who are often attracted by a home's surrounding natural scenery, Asian luxury consumers pay more attention to fengshui (the art of arranging buildings and areas in a good or lucky position) and indoor decoration. Arwaa Mansion covers 110,000 square feet on top of a hill. 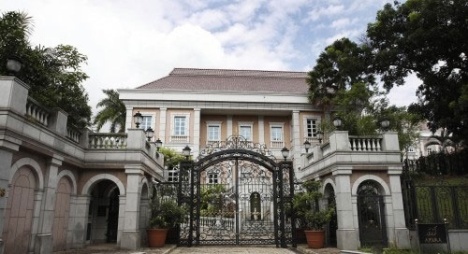 In 2008, the palatial property, estimated to be worth around US$120 million, became the subject of a legal dispute between the brother of the Sultan of Brunei and Brunei's national investment agency. Asia's top 10 super-deluxe homes ranking was unveiled recently in Hong Kong. China now boasts six of the most luxurious residences in all of Asia.